We have been pretty busy around here lately. I cant believe summer is almost over! Well, I don’t really mind too much because I LOVE fall!! My kids and I even decided to start our own school this year (which is basically modeled after the big kid school)… with lessons, experiments, field trips, art classes and other activities… Naturally, I am the teacher (even though there are times when the role seems reversed! There is nothing like kids to humble you… Sometimes they teach me a lesson about a thing or two… most often it is a lesson on patience! Hahaha) The kids have really been loving it! We checked out several “Little Hands” learning & activity books from the library… great books, by the way, if you have a kid around 2-6. They have some great ideas on ways to teach science, math, you name it. Oh yeah… I wanted to say I’m sorry it’s been so long since my last Dinner and Movie post. We will be watching Charlotte’s Web (the cartoon version) this week and making… you know what?… I’ll just let it be a surprise! Tee hee hee! We have been reading the book and we are almost finished! My kids love it! It was one of my childhood favorites as well. ANYWAY! Enough babbling! 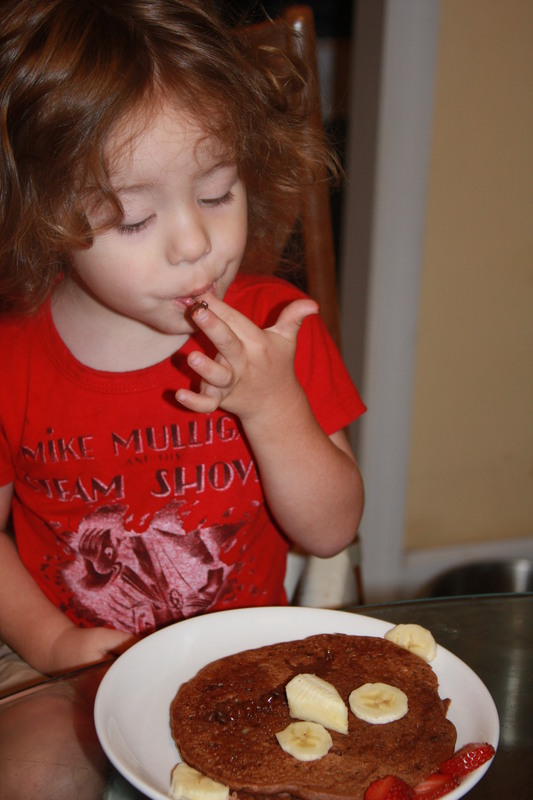 Here’s what we’ve been up to in the kitchen lately! 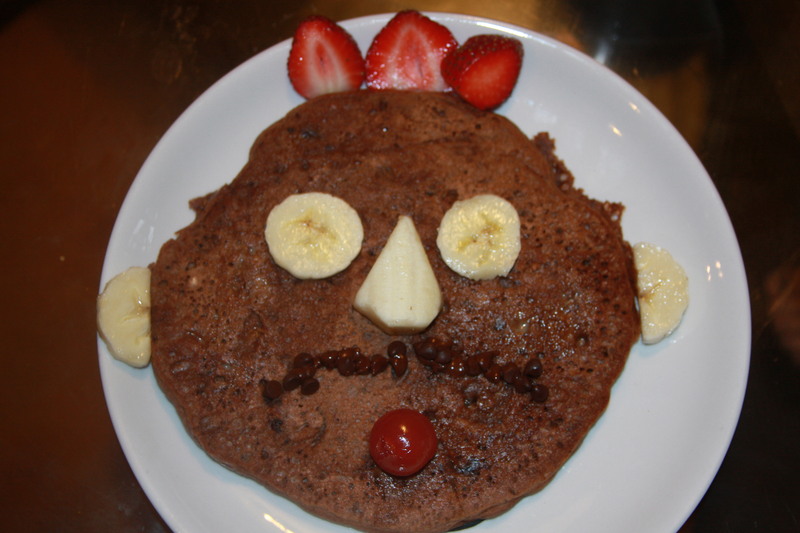 Last weekend, I treated my kids to a healthier version of the “IHOP funny face pancake”. 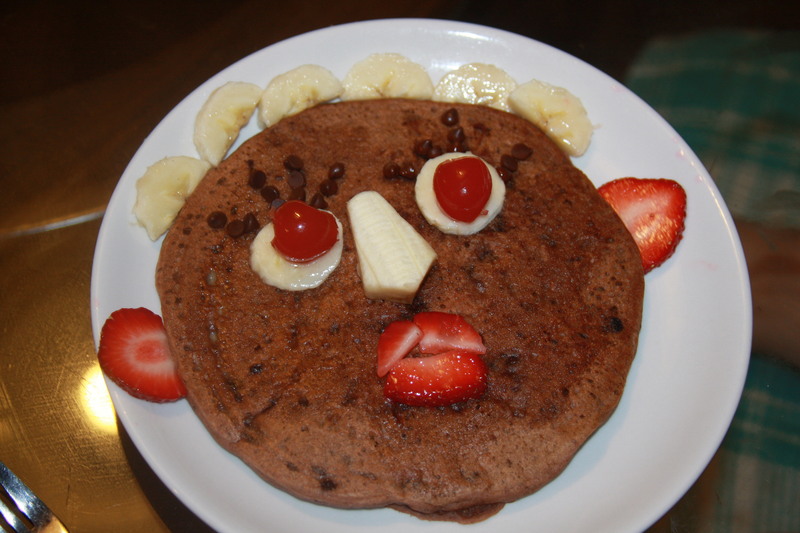 I just used my regular pancake recipe and added 1/3 cup cocoa, 1/2 cup vegan chocolate chips and changed the water amount to 1/3 cup. All you need for decorating is your fruit of choice!! No whipped cream needed! 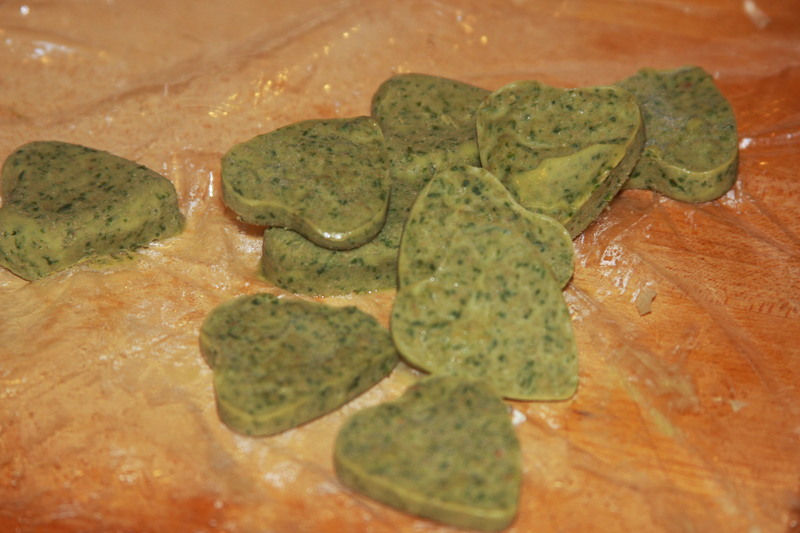 I thought they turned out adorable, don’t you?! The kids just loved them! SOMETIMES A SURPRISE TREAT IS THE BEST KIND!! We accidentally ended up with some chocolate covered strawberries when I left my box of vegan truffles on the stove as it was warming up! Oops! But hey, this was so beautifully meant to be, I’m NOT complaining! They were magnificent! I think I may do that again on purpose! 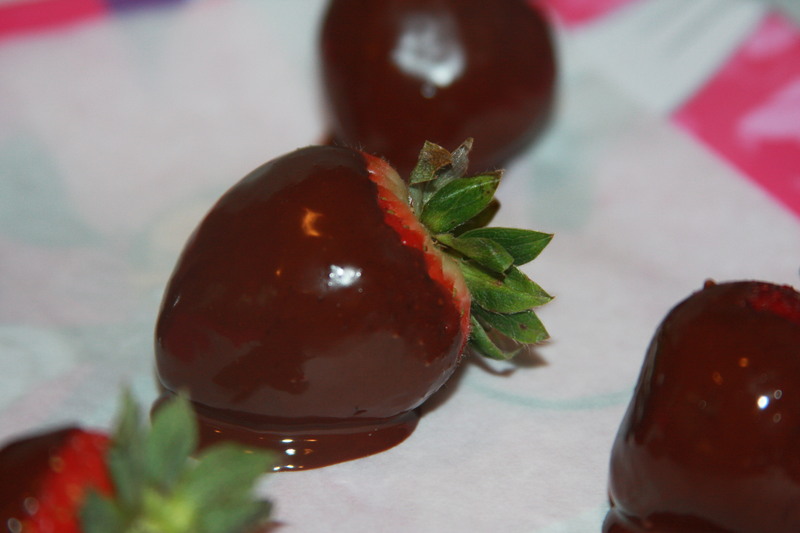 We dipped them, chilled them… then devoured them! HERE”S SOMETHING I’D LIKE TO MAKE! 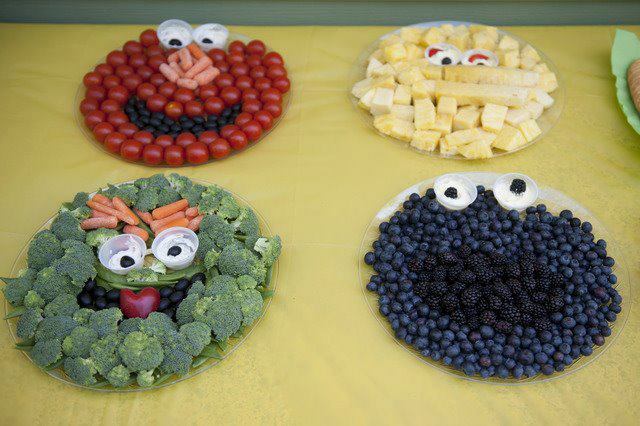 This Sesame Street inspired snack wasn’t made by me… yet! 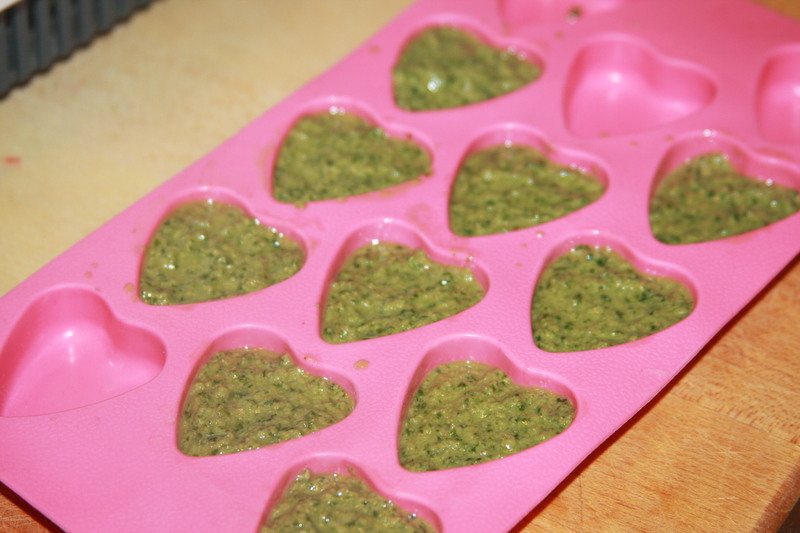 This is on my list of things to make asap! Isn’t it just adorable? 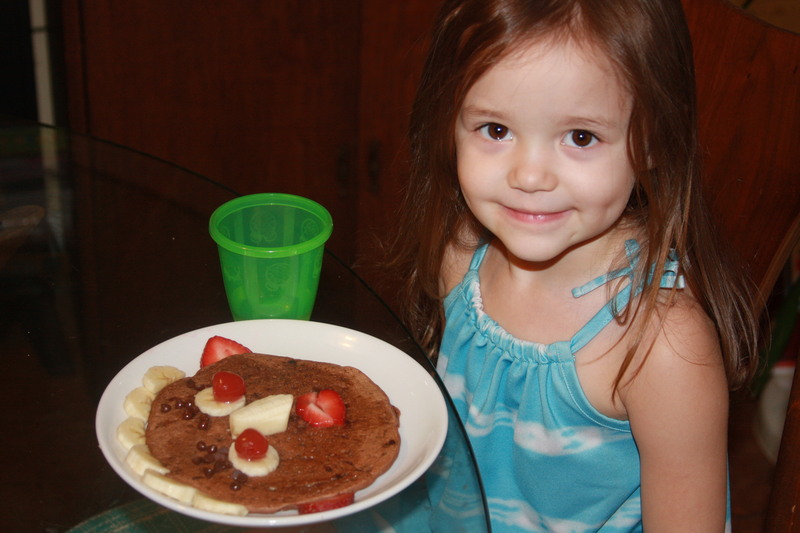 How gloriously fun (& healthy) to eat!